Hello, Dear Visitors! 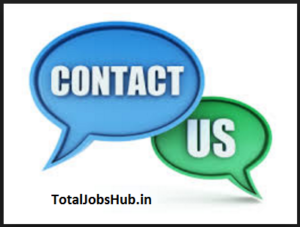 Here on the page “contact us” of our website totaljobshub.in we provide the details through which visitors can reach us easily and put their questions or share the valuable piece of information with our team. If you have any problem, suggestions, or even complaints regarding the content published on our site, do let us know. The information we provide to our end users is verified and rechecked for any flaw. In any case, if there is found to be a typographical error or even network related error, users are humbly requested to inform the team as soon as possible. We would be glad to hear from you. Keep helping us in future to get our support through latest job news and academic updates. Totaljobshub is aimed at serving our visitors from all across the nation and releases day-to-day news and updates. The data arranged for users in this site is free hence, users need not pay any charges to get useful information from here. For time-to-time updates, get a free mail subscription from the totaljobshub team. Now all the important job updates are just a click away from you. Note: All the work done here is for the betterment of our young generation. Stay in touch with our team and keep sharing as much information as possible. Talk to us at "totaljobshub@gmail.com"